Despite the little warm up today and tomorrow, November temps are now just normal for Baltimore. The rain however, is -1.21" for the month, and -7.26" for the year. No doubt, we're still in a drought. But today's rain should help a little. 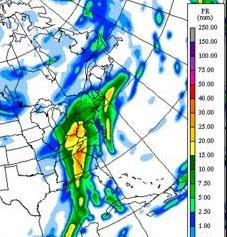 This map here is the Canadian model precipitation forecast for 12hrs ending this evening. The yellow and orange in the mountains highlights over 1 inch (legend is in mm). While this type of system will often weaken after crossing the mountains, we should still get close to 1 inch. This cold front will also be responsible for some thunderstorms overnight. Even better news is for Atlanta. Their reservoirs have made headlines with the potential of going dry next month. Their fortune as changed. Last week, a storm brought over 2 inches of rain. This one could do the same. A little bit a time. To put it all in perspective... Atlanta is still officially -19.08 inches below normal for the year. That is nearly 1/2 of what they should have had by now. Beyond this storm, the colder air will make a return gradually. A taste on Wednesday, then we're back into the 40s with the next surge this weekend.